Today, Camp Moshava's supervisors began their two-day visit at Capital Camps. Moshava is experimenting with a twist on the project's framework, sending the camp's assistant director along with a division head. This is also the first time that a camp's project liaison has come along on the visit. I'm excited to explore how that impacts the experience - each visit this summer is organized a little bit differently, which will allow us to reflect on various exchange structures as we move forward. Many of Capital's program spaces feature breezy open walls. 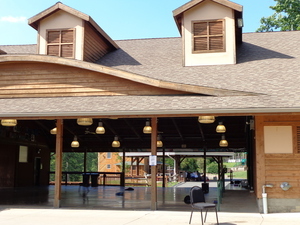 At Capital Camps, I was impressed by the thoughtfulness that had informed the construction of various facilities. Striking a remarkable balance between closed-off indoor spaces and brutally hot outdoor spaces, Capital features several program spaces (like the above photo) with a hard roof and one or two sides, leaving campers with a shady breeze.Not content with a standard zip line, Capital strung a monstrous zip line from a hill above the dining hall all the way across the lake, leaving campers with a unique and unforgettable zip line experience. Moreover, the visitors from Moshava were impressed with Capital's cleanliness, and the lack of paper and garbage on the ground. Adam, our host, said that everyone at camp shares the responsibility for clean-up, and everyone pitches in a few times each week. 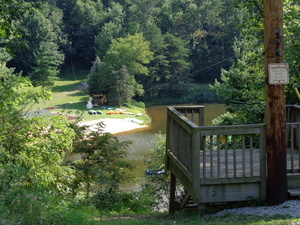 Capital's zip line traverses its lake. Capital's Jewish program was also inspiring. This summer, the newly-hired year-round Director of Jewish Life is facilitating a summer-long rewriting of the camp siddur. Each bunk gets to participate, learning about their assigned prayer, and deciding how they want it represented in the new siddur. Meanwhile, a visual artist is working with campers to lay out and decorate the pages. I've seen this process succeed several times at youth groups and Hebrew High programs (though never at a camp), and it's wonderful when campers get to feel such an investment in their camp's Shabbat services! 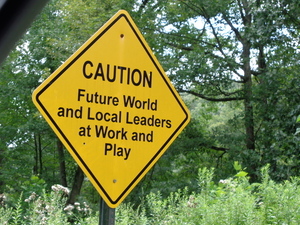 This sign greeted me as I entered Capital Camps' main gate.